What to BNN do when a fridge goes boom. In one of our very first entries we shared our concerns about our not very old but not very healthy fridge. I purchased the fridge as a factory second (new, but with a dent in the door) quite cheaply about 6 years ago. It was an ‘off-brand’ fridge, which didn’t mean much to me at the time. I had made a deal with my Year 9 Geography class that year. We were all writing ‘green’ goals each week – long term and short term. I had told them about my low energy rated, very old and leaky fridge. I’d purchased it as a student for $100. I couldn’t have afforded a new fridge when I purchased it, but I knew it wasn’t great for the environment. In my first year of teaching I made the promise to my Year 9 Geography class that I’d save that year to buy a fridge with a high energy rating. So I did. I purchased the seconds fridge from a store in Brunswick which specialised in white goods with minor aesthetic faults. They were almost all off-brand white goods, inexpensive but with contemporary energy and water ratings. It seemed like a good deal at the time. Part of the reason this fridge didn’t last as long as I’d have hoped was because I moved several times in the last 6 years. Every time you move furniture and electronics there is the risk of damage. Fridges, like pianos, don’t like being moved. Ours started making strange noises after the second move. The other reason the fridge didn’t last long was explained to us when we purchased our new (to us) fridge a few weeks ago. Off brand, inexpensive fridges are designed to last ‘for the term of your lease’. They are made for students, people who are transient and don’t want to be saddled with moving their white goods with each new share house or rental. It made me incredibly sad to hear that, and even sadder that I’d fallen for the trap. These fridges look good on the surface. They’re inexpensive and, on the surface, environmentally aware. In reality they’re poorly made, “disposable” and an incredible tax on our environment and our landfill. One Friday afternoon, a few weeks ago, I opened our fridge and realised that the entire top shelf was filled with mould. This literally happened over night – the mould that is, we knew the fridge was on the out and out for at least a year. Even though we knew in January that this as a likely scenario, and lots of people had given us suggestions then on how to approach this issue, we were totally unprepared. In our new life I searched the web for a reconditioned fridge store in the south eastern suburbs. There was one, Blue Ribbon Appliances in Frankston, and it happened to be open on a Saturday. We could only hope that it was a reputable business and had decent fridges at decent prices. We didn’t have a lot of options. We arrived at 9am Saturday and were greeted by an amiable elderly gentleman who explained their stock and left us to explore and choose. We were already delighted to not be pushed or harassed as we browsed. While we checked out the stock he put through a phone call to the owner to check if he could deliver that day. He could. We had lots of choice in a fridge of the size we required. What’s more, they only stocked fridges they could rely on as they guarantee them for 12 months. By Saturday afternoon we were installing our new fridge. It’s not particularly old, it’s a great size and energy rated. We paid half what we would for a new fridge, including delivery and taking away the old fridge to recycle. Honestly, it was a pleasurable shopping experience. I don’t say this lightly. The fridge did have a minor fault – the alarm started going off every 6 hours (including overnight). The owner of the business, who is also the fridge mechanic, came out and repaired it immediately. If the same thing happened with a new fridge you’d possibly face dealing with the manufacturer in a lengthy game of ‘whose fault?’ in order to get the fridge repaired or replaced. True, it might not have happened in a new fridge, but it’s fixed and working beautifully now. The outcome suits us. Any previous year we would not have taken the bet on a reconditioned fridge. Time will tell if we’ve made a good purchase or not, but right now we feel very positive about how this problem was solved. When we start buying again. Next year, if we decide to end our BNN adventure, we are going to completely change our buying habits. If we decide to buy new things from now on we are not going to buy the best bargain. We are not going to buy the cheapest thing we can and we are not going to get sucked in by sales that are not really offering us a good product or a good price. I want to buy clothing made from quality materials. When possible I want it to be locally or hand made. When we can’t do this we will continue to buy second hand. We will have less clothing, but it will be better quality. I want to buy the best quality home wares. I want to buy kitchen pans that will last forever. Knives and forks that are sturdy and quality and lovely to hold. We will have less home wares, but it will be better quality. When we start to think about new carpet and new curtains and other new things around our house we will search for Australian made, hardy and quality goods. We will have to save for longer and hunt harder to find things we can afford that meet our quality requirements. We will need to prioritise and be willing to wait for the right things. Purchasing things we need will take time and research and sometimes a lot more money than before. If we shop this way we won’t be able to buy on impulse. All of our purchases will be considered. In an ideal future, this is how I want us to be. I mean, ultimately, of course we’ll buy Little Fearse a toothbrush if we need to. But finding a common solution to simple issues is a regular conversation starter in our household now. I think this is a really good thing. We purchase things only when there isn’t an alternative solution. For instance, some people use a bit of baking soda on a face washer to clean their babies teeth. This is probably a good option for us and something we would not have researched if we weren’t trying to be more aware consumers. We intentionally didn’t add a ‘consumables’ clause to what we’re allowed to purchase, because we believe that we don’t need to use all the consumables we buy. We avoid using plastic wrap and in most circumstances can use a lidded container instead. We have decided that we won’t purchase any more of this when we’re finished the current roll. Make Do and Mend Year‘s recent silicon baking sheet disaster made me realise that with a bit of forethought we could have dealt with the baking paper issue. We may have a little hunt for one of these second hand before we run out of baking paper, as I use this quite a bit. We will not replace our dish washing brush, instead we’ll use a coth as others do. We have reusable / machine washable cloths and (due to a well meaning house guest) an abundance of disposable sponges. We will definitely be replacing the smoke alarm batteries. No ifs or buts. Tampons and pads is something that BP wisely has no opinion on. Many people have asked me about this and although I am aware of the many alternatives I’m not ready to start exploring them yet. I’d love to hear from people who have looked at other less disposable options. Buying Nothing New, or becoming a more aware consumer, isn’t just about the big purchases or the major items that cause large and obvious impacts on our environment. It’s about all those little day-to-day things that we often don’t think about. It’s those things that are filling up our rubbish bins and toppling into our landfill more than anything else. We had two gift vouchers remaining from Christmas that were due to run out in May – one for a popular stationary store and one for Myer. We ummed and ahhed over what we should spend them on, as we couldn’t allow them to go to waste. Of all the ideas the only ones we had that seemed to make sense, or were justifiable, were to spend them on Little Fearse. At the stationary store we purchased her a new lunchbox. She didn’t need a new lunchbox. The one we purchased at the op shop is still going strong. We were just at a loss – we didn’t need anything at the shop. It was an empty kind of purchase and it felt like we were cheating on BNN and ourselves. At Myer we bought Little Fearse a winter jacket (much more expensive than we’d usually get) and a winter top that will probably fit her this winter and next. Of course both items of clothing are ridiculously cute. I did get some pleasure out of this purchase because they were things Little Fearse will get a lot of wear out of. Although we can easily purchase clothes for her second hand it’s nice to have the opportunity to buy her something special. It sort of tickled the consumer in me in the way the previous purchase hadn’t. Being at the shopping centre (for only the second time this year) was unlovely. The visuals there are like an assault if you haven’t been for a while. When you’re at a shopping centre already it becomes kind of second nature to pick up something here and something there. Since we’re not buying anything new we ended up purchasing coffee and snacks we didn’t need. My tuna hand roll came in a plastic box with a little plastic tray for the wasabi and a tiny plastic bottle of soy sauce, held together with a rubber band. I felt really guilty about how much packaging was involved in my purchase of one tiny hand roll. I wished I’d had the forethought to at least get them to leave off the plastic container. They had paper bags, which would have been marginally better. Feeling ill at ease about the amount of stuff left over when I’d finished eating I tucked the container into the bottom of Little Fearse’s pram figuring I’d try and find a way to reuse some of it later. The wind was ferocious. While we were unloading the pram the wind stole the sushi box and rubbish and whipped it off across the car park. “Oh no! !” I cried. Big Poppa got ready to chase after, thinking it was his steak that had flown away, or one of Little Fearse’s new purchases. As I saw the box sadly crushed under a car wheel then lift over the edge of the upstairs car park wall I said “Never mind, it was just my sushi box.” I felt kind of relieved in a disgusting way. I no longer had to come up with some fancy way to reuse it. And I felt guilty, too. If it had been one of our purchases or even a $5 note we would have worked hard to retrieve it. Instead I just watched the little box float away. I wish it was easier – that we didn’t have to work so hard to be good and ecological. Isn’t that terrible? I know that it is true, though, that if it were easier we’d all be much more willing to recycle more or purchase organic food more often or try harder to reduce our waste. It makes me sad to know that even though our little family feels like we’ve come such a long way we still have so much (SO MUCH) further to go. We’re really just a few steps along the pathway to becoming more aware people. A few tiny steps. When the consumer in me just doesn’t know how to quit. 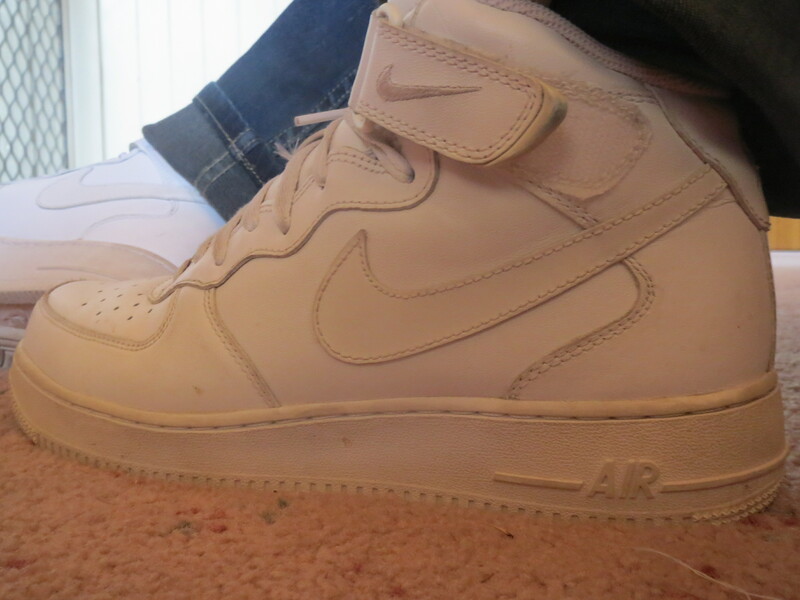 Seven years ago, in the flush of a new romance with a renowned sneakerhead I walked into Footlocker and on impulse laid down $200 of my very hard earned cash (I only earned about $100 a week outside of study support) and bought a pair of bright white Air Force 1s. Quite honestly, I had never stepped foot in Footlocker before meeting BP. We were in there looking for shoes for him – something that happened waaaaaay too often – and suddenly some weird, perfectly designed combination of the right tempo in the music, the right lighting in the shop, the right sales person paying just enough (but not too much) attention in the background and the aforementioned sneakerhead romance and I was parting with my rent money savings for a pair of sneakers. Wha? What just happened? Air Force 1 high tops take a fair bit of breaking in. There is a period of ankle rubbing that you need to get through to make them comfortable. I just didn’t have it in me. I’ve worn them here or there to a gig with BP, or once, memorably, when I dressed up as a student for a school charity day. That was the day one of the students was overhead saying “Damn, Miss F looks freeeeeesh!” Yes, that day. They’ve spent a lot of time in the wardrobe in the last couple of years, only to be pulled out recently by Little Fearse who is going through a shoe phase (which involves eating shoes, not wearing them – that phase is yet to come). BP made a rare ultimatium – “Wear them or sell them”. So, today, I wore them. They hurt my ankles AND my toes. And they’re just not the kind of get up you wear to Mums group at a play centre. Why can’t the rational me give up these shoes that I bought on impulse seven years ago but have never enjoyed wearing? Is it that I just don’t want to admit I was wrong when I bought them? Or do I like what they signify – a simpler time in my life? Or do I really like how they look but not how they feel? Or am I still holding on to their monetary value even though that $200 would have been well spent on something else by now, if not these shoes? What do you do when the consumer in you just doesn’t know when to quit?